It’s finally here – introducing Black Spirit 200! Blessed with incredible practicality and an exhilarating range of sounds and features, immense power, and weighing in at just 8 lbs. (that’s 3.6 kg! ), Black Spirit 200 is truly like no amp before. Black Spirit 200 is the first amplifier to feature our revolutionary new ‘bionic’ Spirit technology. Made here in Germany and housed on a sealed PCB, the Spirit Tone Generator faithfully recreates the vivid interactions of traditional tube amp circuits in a strictly analog way, delivering world class tone and responsiveness. The amp features four channels – Clean, Crunch, Lead, and Ultra – which cover all the iconic guitar sounds of the last 60 years, plus a comprehensive range of built-in reverb, delay and modulation effects. 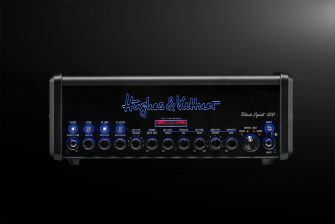 Black Spirit 200 is also the world’s first analog amp to feature a power amp sagging control, which lets you adjust the amount of power amp sag regardless of the volume level. Tasty! What’s more, the amp can be played through any kind of speaker – from standard guitar cabinets to active and passive PA speakers, studio monitors and even hi-fi systems – and the new generation Red Box DI out now offers eight ultra-realistic cabinet simulations, making it the perfect mic-free solution for stage and studio. Thanks to the H&K Smart Rotary Control technology you already know and love from GrandMeister Deluxe 40, every pot setting (including EQs and gain, and sagging) on Black Spirit 200 can be saved and recalled in up to 128 presets using any compatible MIDI footswitch, and unlimited tonal presets are possible when using the amp’s free App for iPad via Bluetooth. Black Spirit 200 packs a massive 200 watts of power, making it loud enough for the biggest of stages. The amp can also be reduced to 20, 2, or even 0 zero watts for silent recording and bedroom practice. And with a headphone out and an Aux in – or using Bluetooth – you can jam along to your favorite tunes any time inspiration strikes.